Team Realtree's Pro Staff, friends and associates had another great deer season in 1999. It was so spectacular that, once again, the popular Monster Bucks Video Series is releasing its eighth edition in two volumes. There was just too much great action to leave any of it on the cutting room floor. According to Bill Jordan, designer of Realtree Camouflage and company president, "Monster Bucks VIII reflects what has to be the most productive year the Realtree Team has ever experienced. It was magical!" Monster Bucks VIII, Volume I is entitled "Keeping the Tradition." It includes 19 incredible encounters, including nine bowhunts and 10 gun and muzzleloader hunts for truly great bucks that you have to see to believe. 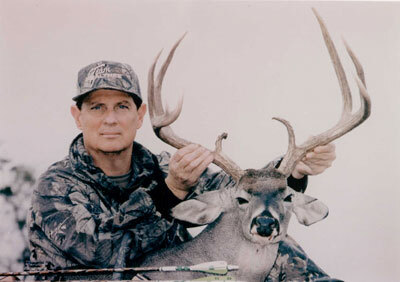 Among the highlights, comedian Jeff Foxworthy continues his big-buck streak by taking a huge Texas buck scoring 168 Boone and Crockett points. Not to be outdone, Bill Jordan rattles in a monster Saskatchewan brute weighing 350 pounds. These are only two of the exciting hunts featured on Volume 1 of Monster Bucks VIII. To "keep the tradition" and keep them honest, included also are their near misses  just to prove that even members of the Team Realtree Pro Staff are fallible. Monster Bucks VIII, Volume 2 is entitled "Hunters' Pursuit." It features 20 awesome hunts from Montana, Texas, Kansas, Saskatchewan, Idaho, Wyoming and Colorado. In 95 minutes, you will witness nine exciting bowhunts and 11 great gun and muzzleloader hunts. In this action-filled video Bill Jordan arrows a record-book buck at 15 yards! Jay Gregory also rattles in a Kansas brute, scoring 176 Pope and Young points, to within 15 yards before loosing an accurate arrow. Other action includes Dale Earnhardt, David Blanton, Michael Waddell, Joe Drake, Terry Rohm and others taking monster bucks. The two volumes of Monster Bucks VIII show some of the greatest whitetail hunting video ever captured on video! Together the two tapes feature 39 action-packed deer hunting adventures and you won't want to miss a single one. The two volumes of Monster Bucks VIII are sold separately and are available on VHS video tapes. Look for them in your local video or sporting goods stores. Suggested retail price is $14.99 per tape. To order direct, call 1-800-474-8733.